India ITME Society’s much awaited key event of 2019, GTTES 2019 opened today with new optimism,new opportunities & new prospects for the textile industry with 400+ Exhibitors, 49+ Countries & 65 International Business Delegations. Esteemed Dignitaries from Embassies & Ministry & numerous guests from Industry along with International business delegates attended the opening ceremony of this Textile Technology & Engineering event. With a commendable growth of 26%, GTTES has set the standard in its very 2nd Edition & is a testimony to global reach of GTTES as a trusted opportunity for business & gateway to India. First time participation from Sri Lanka & Slovenia and countries like Belgium, China, France, Germany, Italy, Japan, Spain, Turkey, UK, USA, Taiwan, Morocco, Algeria, Djibouti, Kuwait, Azerbaijan, Kyrgyzstan, Senegal etc. indicate that this event has achieved its place as a reliable international business platform for both domestic and overseas companies. GTTES 2019 shall facilitate interaction with all Export Promotion Councils which again shall help industry to know more about export opportunities, various Government subsidies, market initiative schemes available for Indian manufacturers & help to gain information and develop new opportunities for exports from India. The product launch of Colorix Digital Printing Solution by Orange Group to unveil dye-sublimation solution at GTTTES was again a highlight of the event. 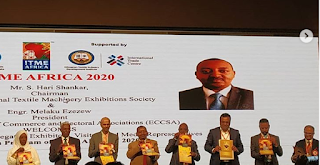 Concurrent to GTTES 2019 India ITME Society also proudly announced the Launch of an International Event – ITME AFRICA 2020. Set to initiate a revolution in generating employment, encouraging skill development, motivating entrepreneurship in Textiles, ushering investment, economic growth and thus bringing new aspirations for younger generation of African countries, 1st edition ITME Africa is to be held in Millennium Hall, Addis Ababa, Ethiopia from 14th to 16th February 2020. 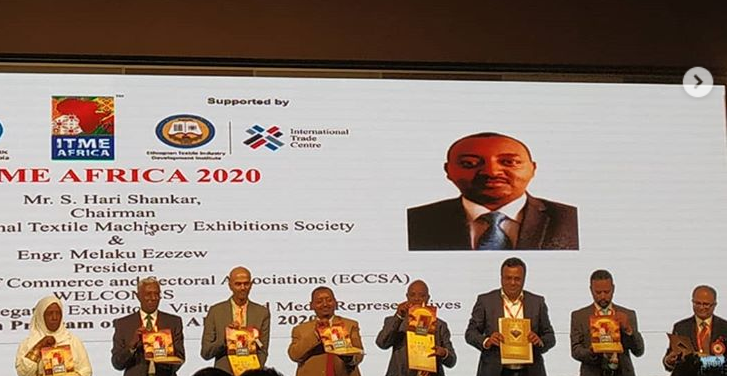 In a first of its kind joint venture, India ITME Society and Ethiopian Chamber of Commerce and Sectoral Association(ECCSA) a premier organization in Ethiopia, along with International Trade Center brings this unique and exclusive business facilitator opening up an entire continent of new opportunities. This event was exclusively covered by CNBC. With an effort to open up all possible opportunities for Trade & Investment with other countries & to review & expand further trade activities in this regard India ITME Society had invited several foreign buyers / delegates from Egypt, Ethiopia, Bangladesh, Sudan, Rwanda, Uganda, Ghana, Nepal, Tanzania, Russia & Cambodia for B2B meetings. In the specially designed B2B matchmaking area, the registered participants had a chance to meet with International Business delegates, with a personalized service which gave them an opportunity to make the right connections with the right people they wanted to meet through prearranged meetings. This initiative showed tremendous response & many of the interested participants had to be waitlisted. Apart from the B2B meetings, there was an Industry Interactive Session to facilitate Govt / Industry Interaction. Ms. Surina Rajan, IAS, Director General, Bureau of Indian Standards (BIS) was available for open interaction with Industry members. This helped the Industry in direct representation towards formulation of policy for standardization, promoting exports / imports & control proliferation. The main points of discussion included, Overview of Standardization work done by BIS in the field of Textile Machinery and Accessories. Issues related to Noise emissions and Safety aspects of textile machinery and adoption of related ISO standards & Inputs required for identified new subjects such as Embroidery Machines and Baby diaper making machines. GTTES 2019 is the apt platform to connect the exhibitors with many new markets which has never looked at India as sourcing opportunity. Both for Indian manufactures and foreign exhibitors this new and developing markets shall bring future opportunity for business and expand their customer networking in an unprecedented way. GTTES is a must to visit event for every big, small companies in textiles and textile engineering as it is the largest and key business event for the year 2019.